NoviFlow NoviSwitches™ deliver the fastest fully programmable forwarding plane solutions in the market, with up to 6.5 Tbps of genuine wire-speed performance. Our switches are specifically designed for deployment in carrier networks and data centers looking to improve the cost/performance, security, scalability and flexibility of networks. Applications include Cyber-security, vBNG, Data Center Inter-Connect, In-Line Packet-Brokering, Monitoring and Telemetry, NFV, EPC, Cloud, and Hyperscale Networking. 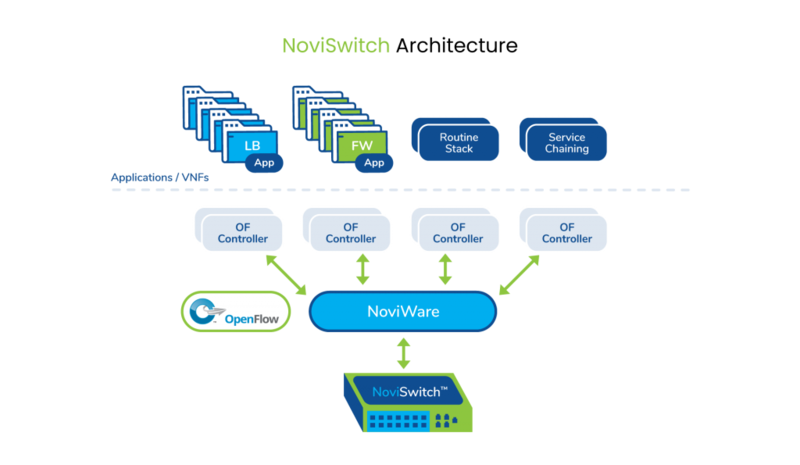 NoviSwitches leverage the NoviWare™ Network Operating System to deliver maximum programmable pipeline capability in a compact form factor with the most complete implementation of OpenFlow v1.3/1.4/1.5 available today as well as key open interfaces including gRPC, SNMP, CLI, and P4-Runtime. The system is provided in a stand-alone, self-contained, rack-mountable enclosure box that can be configured to support a wide variety of networking applications to deliver unmatched performance levels. At the heart of the NoviSwitch 2000 series is the Mellanox EZchip NP-5 processor, offering throughput of up to 400 Gbps, massive tables with up to 1 million flow rules in TCAM for wildcard matches and up to 6 million flow rules in DRAM for exact-matches, full support of the industry’ leading H-QoS feature, the same Traffic Management engine found in high-end vendor line cards costing ten times as much! NoviFlow also offers the NoviSwitch 5000 using the Barefoot Tofino switching chip with a massive throughput of up to 6.5 Tbps for even the largest network deployments, and featuring the game-changing Tofino telemetry capability with both In-band Network Telemetry (INT) and digest (Postcards) telemetry options!